הפוך פנדה שוכב על ענף עץ עם במבוק ברקע, והמילים "1500Yuan 100 g Ag 999"
פנדה שוכב על ענף עץ עם במבוק ברקע, והמילים "1500Yuan 100 g Ag 999"
מטבע זהב פנדה סיני במצב Proof שנת 2016 משקל מאה גרם This beautiful proof quality Panda gold coin is strictly limited in mintage, don't delay in ordering yours! 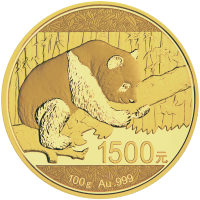 The Chinese Panda coin is one of the few government issued bullion coins to change the reverse design every year. New for 2016 all silver and gold Chinese Panda coins will be issued in gram sizes rather than troy ounces. The obverse features the Hall of Prayer for Good Harvests (The Temple of Heaven), the title of the People's Republic of China in Chinese characters, and the year 2016. This year's reverse design depicts a panda bear lying on a tree branch with a bamboo forest in the background. The 2016 Pandas also have the weight and purity stamped on them unlike the 2015 coins, along with the coin's face value. This coin is legal tender of the People's Republic of China. This beautiful release continues a more than thirty-year old tradition which began in 1983.